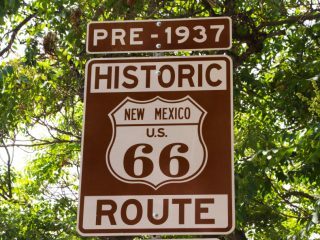 We’re running a Route 66 special to highlight a forgotten piece of Santa Fe history, before the 69-mile cutoff that rerouted the road from Santa Rosa straight to Albuquerque. The realigned route is much more direct, which is why it was replaced by Interstate 40. 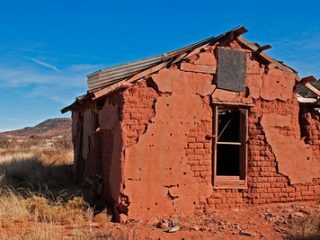 But what actually motivated the change was revenge against the Santa Fe Ring, a corrupt group of land speculators and businessmen tied to the Republican Party who controlled state politics. When their “dirty tricks” helped defeat Democratic Gov. Arthur T. Hannett, he used what remained of his term to cut off Santa Fe’s nose to spite its face. 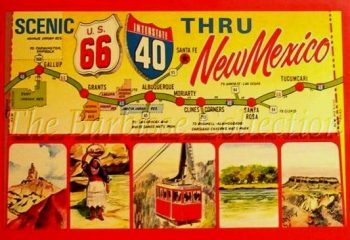 Santa Fe lost out on the prosperity that flourished along “The Mother Road” from the Dust Bowl-inspired migration west to the automobile tourism boom of the 1950s. 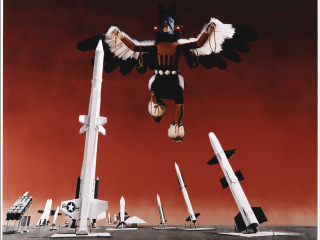 But considering the shape that boom took—the teepee-shaped motels, Indian curio shops, fast-food restaurants, and hyped roadside attractions—maybe it was just as well for Santa Fe! In any case, when I-40 was being built in the early 1960s, communities that had flourished along Route 66 flexed what political muscle they had to keep the new interstate from bypassing their business districts—and leaving a trail of Route 66 ghost towns like Newkirk, Montoya, and Bard, and towns that never recovered, like Cuervo and San Jon. 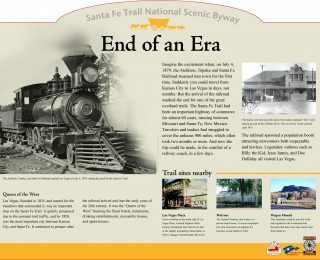 Santa Fe fared no worse for missing out on Route 66, having come through the demise of the Santa Fe Trail and the Atchison, Topeka and Santa Fe Railway. We didn’t make it onto the Route 66 National Scenic Byway, and a granite marker on the Santa Fe Plaza commemorates the physical end of the Santa Fe Trail National Scenic Byway. 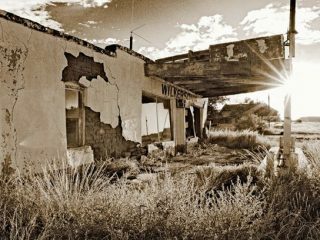 Much of what used to be Route 66 lies under sections of US 84 and I-25 to Las Vegas and I-40 to Albuquerque. 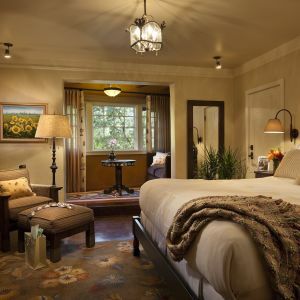 But whether you’re out haunting El Camino Real or the National Old Trails Road, our doors remain open to all weary, nostalgic travelers as your final destination. 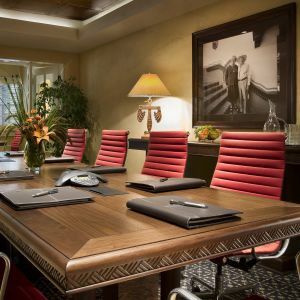 Spring has arrived…nurture your creative side and indulge your senses at Detours where cultural treasures abound. From rustic, interesting pieces with a good story to handmade textiles, pottery, glassware, jewelry and accessories that have been hand selected locally and from all corners of the World. 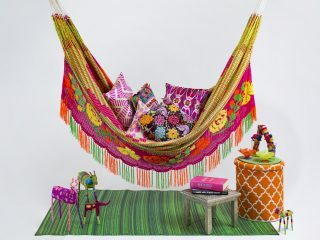 Our commitment is to offer quality products for thoughtful gift giving as well as for your personal enjoyment...from functional to whimsy, gifts that make you smile. New merchandise is arriving weekly, so check back often. 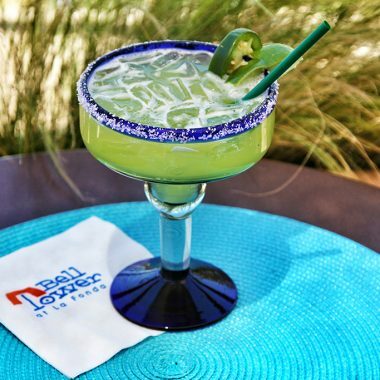 As warmer weather moves in, what's more refreshing than an ice cold, freshly made margarita? However, springtime is often characterized with unseasonably cold and warm weather. This month we decided to share our recipe for an in-between season margarita that's both hot and cold, our Bell-Ringer Margarita that is infamous up on the Bell Tower at La Fonda. 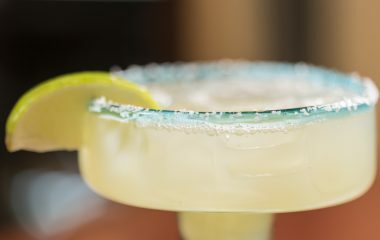 And, don’t forget to download the new Margarita App from your app store. La Fonda has 3 stops along the trail, La Plazuela, La Fiesta and The Bell Tower. Pour salt onto a round plate and mix in lemon and lime zest. Rub a wedge of lemon or lime around the rim of the glasses, then dip into the salt. Fill the glass with ice and set aside to chill. If you like your margarita “Up”, empty the ice before serving. Add the tequila, the Patron Citronage and the lemon and lime juice. 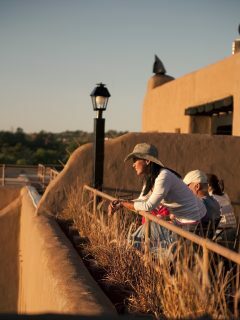 Enjoy with a Santa Fe sunset! 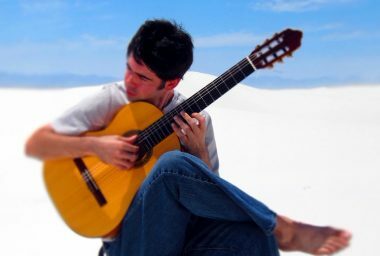 Classical guitarist Christian Vincent dropped in to La Fiesta Lounge one night after a friend recommended him, and came away feeling pretty intimidated: a great band had the crowd dancing, and he’s “mostly a solo guy…”—a new musical treat for people who prefer to listen. We discovered him by word of mouth, and Vincent will be debuting at La Fiesta Lounge on April 29. Let us know what you think of this young guitar phenomen and his solo stylings. Though he mostly lets his fingers fly, Vincent says he has some tracks that might bring people to their feet. If not, he plays with a some belly dancers who could inject some excitement to his act. 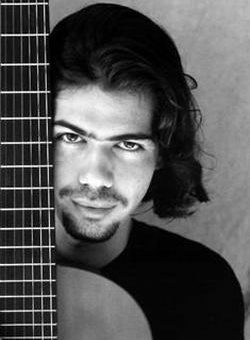 Listen to samples from his album Crosswinds, “an eclectic blend of rumba flamenco, classical and world music,” or book him for your own event at christianvincentmusic.com. 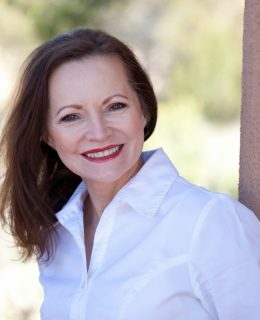 Canadian performer Talia Pura recently founded Blue Raven Theatre, which inhabits the former Warehouse 21 at the Railyard, now known as the Studio Center of Santa Fe. Its next production is The Passion of Ethel Rosenberg by Edward Morris (Apr. 26-May 6). Also at Studio Center, Maura Studi (wife of actor Wes) will direct young actors in staged readings of two plays by Paddy Chayefsky (Apr. 7-8). 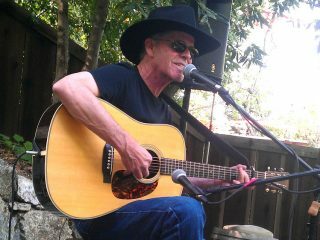 Meanwhile, Teatro Paraguas presents Robert Marcum paying tribute to Gordon Lightfoot (Apr. 8), Daphne’s Dive by Quiara Alegria Hudes (Apr. 5-22), Carmen La Golondrina (Apr. 28-29), and The Gin Game by D.L. Coburn (May 10-27). 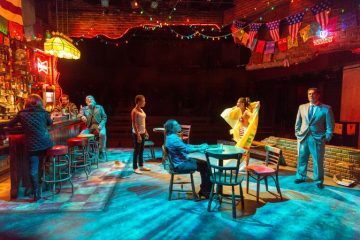 At Santa Fe Playhouse, it’s Talking With by Jane Martin (Mar. 29-Apr. 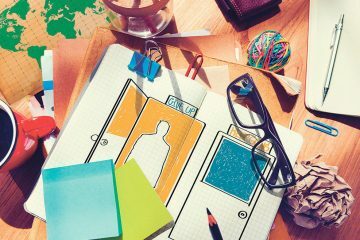 15) and Flight Plan, a world premiere by local playwright Marguerite Louise Scott (May 12-20). 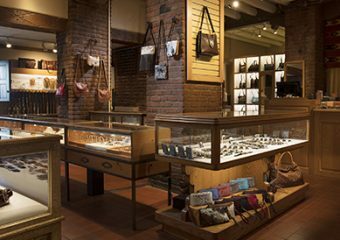 Things Finer has been Santa Fe's premier source for fine antique and contemporary jewelry for over 25 years. 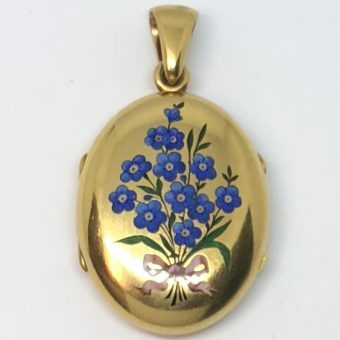 This year, April showers bring beautiful Victorian forget-me-not lockets. 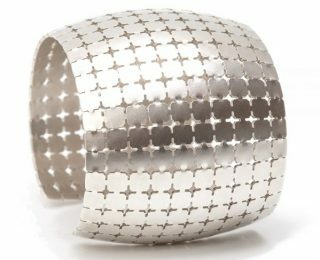 Call 505-983-5552 or visit the website, ThingsFiner.com. Spring is in the air at Tom Taylor. 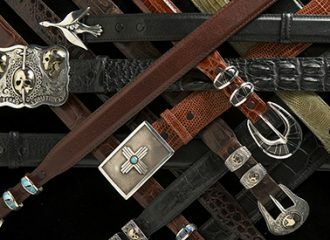 April brings new additions to their world-renowned collection of distinctive belts, buckles, bags, jewelry, and accessories. 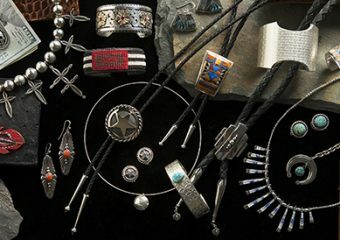 All of their works of wearable art are handcrafted in the USA by prominent local New Mexico silversmiths and leather artists. 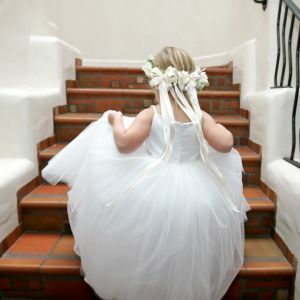 Visit Tom Taylor online or stop into their La Fonda store to subscribe to their Newsletter for announcements and special offers on their new Spring Collection, or, call (800) 303-9733. 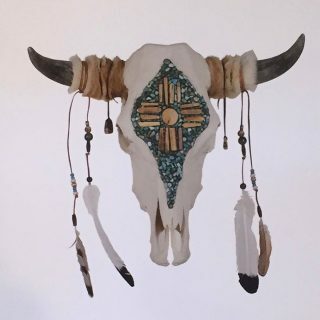 Art fair season kicks off early with the 14th annual Native Treasures market at the Santa Fe Convention Center, a benefit for the Museum of Indian Arts and Culture that features 200 artists offering high-quality works for sale over Memorial Day weekend (May 25-27). 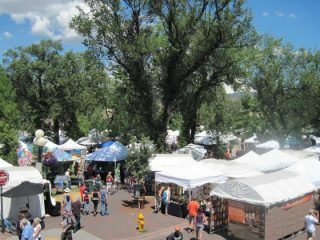 Also that weekend, the Northern New Mexico Fine Arts and Crafts Guild holds the first of three summer craft fairs in Cathedral Park (May 26-28), and the Santa Fe Society of Artists begins its weekend art fairs just west of the Plaza on W. Palace Ave (Apr. 21 through Oct. 14). 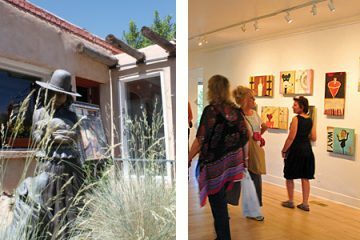 Spring studio tours give you an excuse to take a nice drive, starting with the picturesque rural community of Corrales (May 5-6), followed by Eldorado, just north of Santa Fe (May 18-20), and mountainous Placitas (May 12-13). 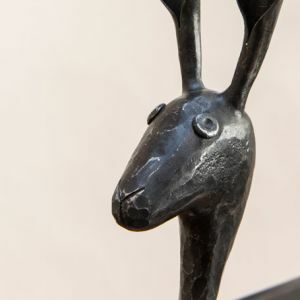 Back in Santa Fe, artists emerge from hibernation for demonstrations, competitions, and interaction at the Canyon Road Spring Art Festival (May 12). 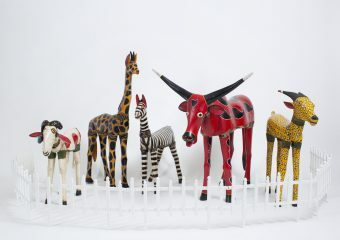 And if all that hasn’t broken your budget, the 9th annual Folk Art Flea offers gently used folk art for sale at the Museum of International Folk Art (May 5). 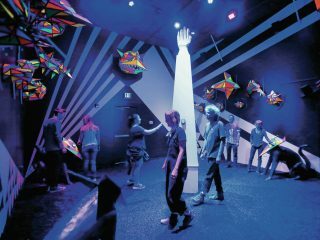 And if you’ve been putting off visiting Meow Wolf’s House of Eternal Return, New Mexico residents get discounted entry Apr. 6-8, with special performances on Sunday. 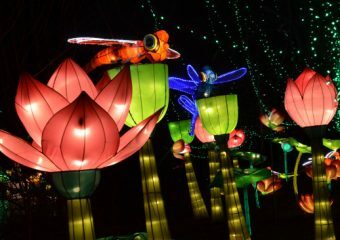 When you’re done shopping on Canyon Road, the 14th annual Japan Cultural Festival offers food vendors and entertainment at the Santa Fe Convention Center, with a focus this year on festival lanterns (May 19). 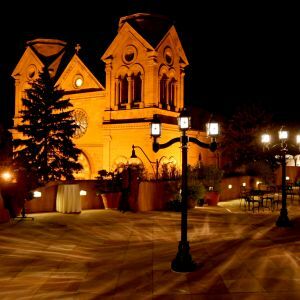 Rub elbows with Santa Fe notables at the Governor’s Charity Ball (Apr. 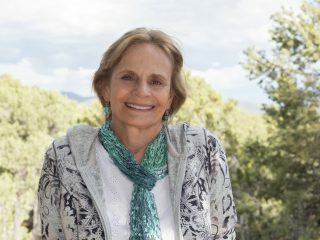 7) or spend an evening with author Anne Hillerman (daughter of Tony), including dinner and wine (Apr. 19). 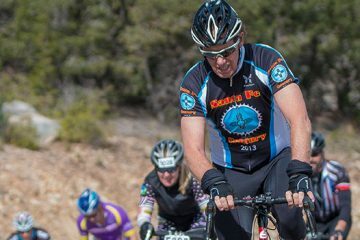 And the traditional opener for bike-riding season takes place here at the Santa Fe Century, which has 25, 50 and 100 mile options on the Turquoise Trail and through Galisteo, starting this year from Santa Fe Community College (May 20). The Santa Fe Symphony winds down its season with principal conductor and violin virtuoso Guillermo Figueroa performing with his sister, pianist Ivonne Figueroa (Apr. 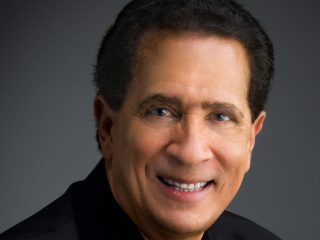 12); Figueroa then leads the orchestra in Ernesto Cordero’s Grammy-nominated Insula Tropical (Apr. 15). For the season finale, Steinway artist Elizabeth Joy Roe plays Beethoven, Brahms, and Barber’s Pulitzer-winning Concerto for Piano (May 19-20), all at the Lensic. Kronos Quartet comes to the Lensic (Apr. 21), followed by a concert of Mozart and Friends with conductor David Felberg and pianist Benjamin Hochman (Apr. 28-29); Russian pianist Daniil Trifonov follows with a wide-ranging selection (May 1). 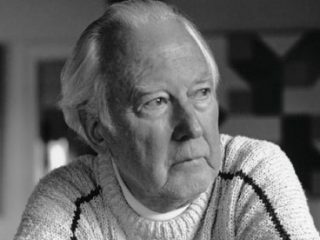 Also from Performance Santa Fe, Joe Illick looks at Brahms for his latest performance talk at the United Church of Santa Fe (May 15). Meanwhile, the clubs are heating up with a calendar of music suited to patios and late nights. 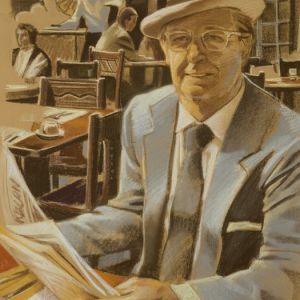 At the Lensic, the Imbroglio Sextet plays a selection of Haitian, Argentinian, Spanish, classical and jazz (Apr. 3), followed by jazz icon Fred Hersch and Friends (May 31). The hit band Portugal.The Man plays the Santa Fe Community Convention Center (Apr. 18), and at the clubs, Luna plays the Bridge at Santa Fe Brewing (Apr. 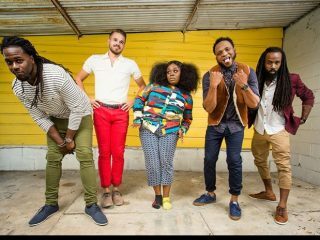 9), followed by Tank and the Bangas (Apr. 10) and Pokey LaFarge (May 4) ), The Posies (May 30). At Gig, Mile Twelve (Apr. 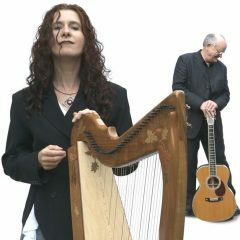 18) is followed by Irish harpers Maire ni Chathasasaigh and Chris Newman (Apr. 20), the Austin Piazzola Quintet (Apr. 21), Adrian Legg (May 1), Alam Khan (May 5), and Leni Stern African Trio (May 19). 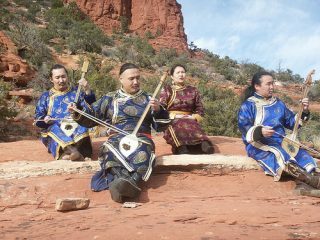 Mongolian throat-singers Chirgilchin play Scottish Rite Temple (May 11). 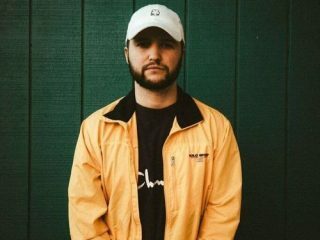 Meow Wolf hosts Quinn XCII (Apr. 1), Chrome Machine Tour 2018 (Apr. 4), Frankie Cosmos (Apr. 7), HUNNY (Apr. 10), Thriftworks (Apr. 13), Moving Membranes (Apr. 14), La Santa Cecilia (Apr. 19), Random Rab (Apr. 20), Japanese Breakfast (Apr. 24), Heartless Bastards’ Erika Wennerstrom (Apr. 25), and Chastity Belt (Apr. 30). Following in May is The Garden (May 1), Desert Daze Caravan (May 4), King Tuff (May 5). Check their calendar for more events. Humor shakes the Lensic in the form of Doktor Kaboom, who performs the family-friendly It’s Just Rocket Science (Apr. 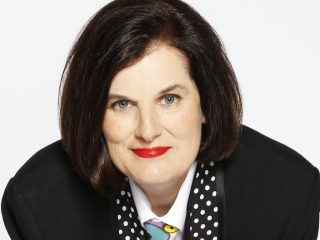 8, preceded by free crafts and games), comedian Paula Poundstone (Apr. 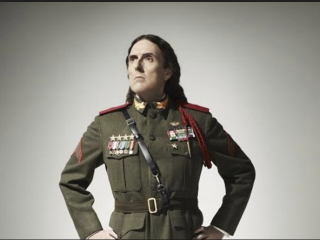 13), and Grammy-winning song parodist Weird Al Yankovic (May 6). 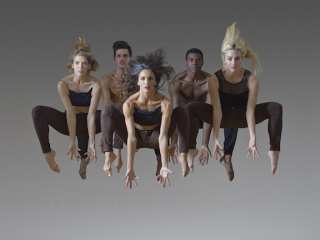 The Lensic also hosts a number of edgy dance companies: New York’s Parsons Dance (Apr. 6), the Japanese troupe Tao (Apr. 19), and rising dance star Jacob Jonas The Company (May 3). 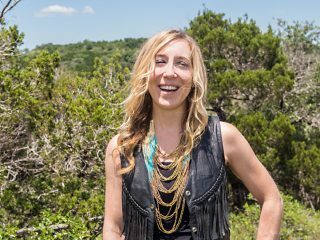 Cherokee performance artist DeLanna Studi (niece of the actor Wes) wrote and performs And So We Walked: An Artist’s Journey Along the Trail of Tears at the Lensic (May 23). Learn more about the making of this work here. On screen, Met Live in HD broadcasts a new production of Mozart’s Cosi Fan Tutte set on Coney Island (Apr. 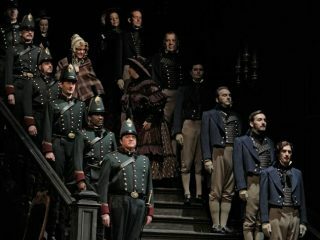 7); Placido Domingo in Verdi’s Luisa Miller (two shows, Apr. 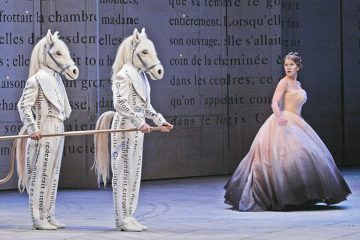 14); and the Met premiere of Massenet’s Cendrillon/Cinderella (Apr. 18, May 5). National Theatre Live in HD screens Macbeth (May 12). Youthquake is a four-day high school arts festival centered at the Railyard that showcases student films at Violet Crown Cinema and student performance at Studio Center (April 18-22). 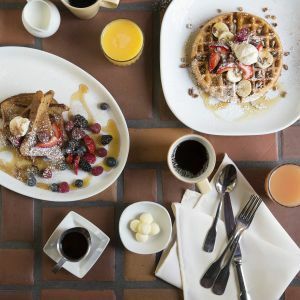 A number of events support the Future Shock exhibition at SITE Santa Fe, starting with starting with “Digest This!,” where you can enjoy 3D printed pancakes and learn about thermodynamics (Apr. 7). Artist Patrick Bernatchez holds a sonic event entitled Goldberg Experienced.04/GE0433RPM, a composition for eight pianos played on eight speakers (Apr. 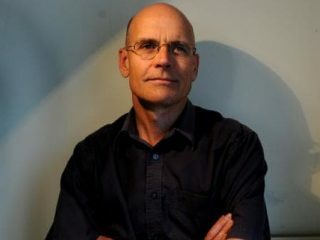 19-21), and a companion installation based on Bach’s Goldberg Variations (Apr. 20), plus short films by Bernatchez (Apr. 19). 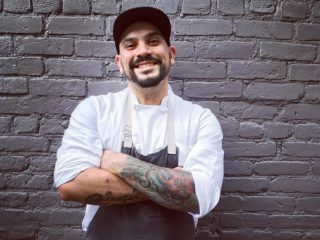 Then Chef Tharon Weighill from Denver presents culinary creations related to the exhibition themes (May 2). 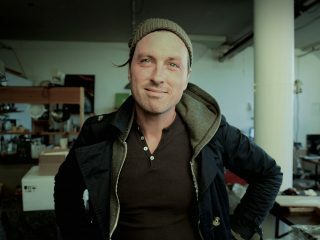 Artist Alexis Rockman also discusses his work (May 3). SITE also introduces a new fundraiser, the Surrealist Supper with Exquisite Corpse Auction (Apr. 13), followed by the more family-friendly Exquisite Corpse Drawing Spectacular, featuring dozens of artist teams competing, with music, food and drink (Apr. 14). The New Mexico Museum of Art will host a panel discussion of pueblo pottery (Apr. 8) and the annual free concert by the Santa Fe Concert Band (Apr. 22). Take in 3-minute art presentations for Fast Art Day (Apr. 6), or join in the worldwide Slow Art Day and contemplate works for 10 minutes each (Apr. 14). 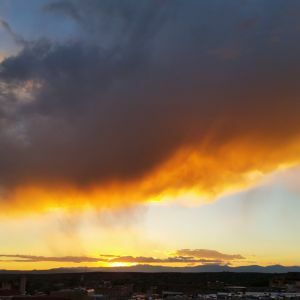 Celebrate Shakespeare’s birthday with a performance from the Santa Fe Shakespeare Society (Apr. 21) . The museum opens two new exhibitions with a reception on May 25: painter Frederick Hammersley and photographer Patrick Nagatani. 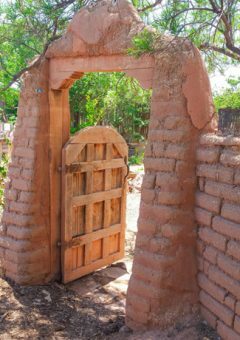 The New Mexico History Museum’s regular lecture series includes the history of Santa Fe Style (Apr. 4) The Rise and Fall of Tin Pan Alley (Apr. 8), a mini-symposium on biodiversity through art and science (Apr. 13-14), and the legacy of the courthouse raid that helped define the community of Tierra Amarilla. 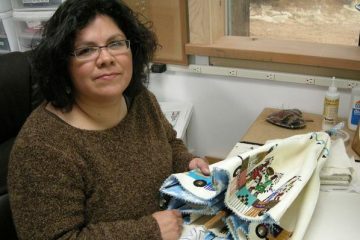 Teri Greeves discusses her beading work at the Museum of Indian Arts & Culture (Apr. 8), followed by talks on the use of GIS technology to map ancient Maya sites (Apr. 28) and on archaeological research into stock management in the pre-Hispanic Southwest (May 26). 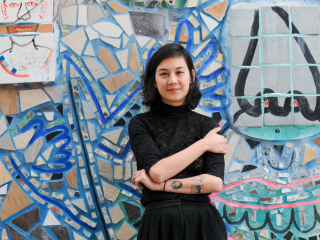 At CCA, the annual Santa Fe Zine Fest takes place April 14, and the Ciel Bergman show closes with an immersive multimedia performance with local performers curated by Santa Fe-based Matron Records (Apr. 28). 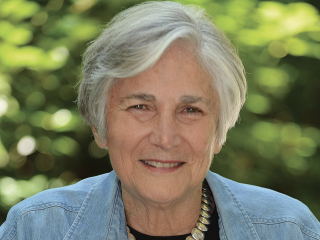 The Lannan Foundation speaker series presents education advocate Diane Ravitch with author Jesse Hagopian (Apr. 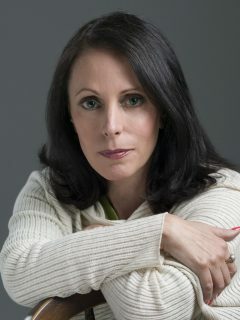 11), novelist Rachel Kushner with Bookworm host Michael Silverblatt (Apr. 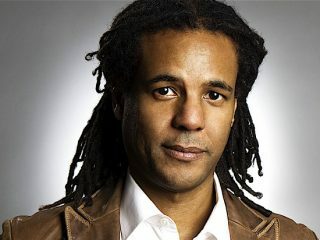 18), Australian author Clive Hamilton and Lisa Sideris on environmental ethics (May 2), and Pulitzer winner Colson Whitehead with Kevin Young (May 9), all at the Lensic. 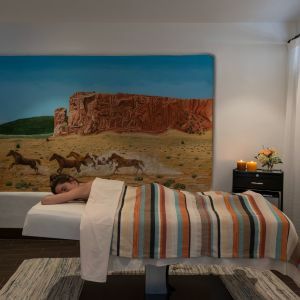 Forbes Travel Guide: Best Way to Spend Two Days in Santa Fe.